This week we are longing for the springtime; London is feeling chilly and grey. 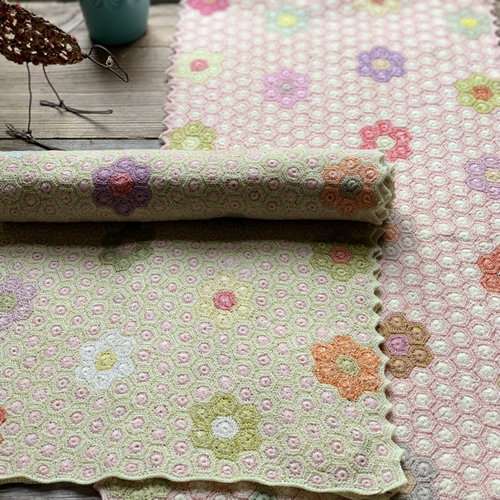 So, how lucky we are to have brand new Sophie Digard items in gorgeous happy colours to cheer us up! We have lots of different scarves, with new designs and a new colour palette. The new palette is called ‘Pschitt’, after a French soda first sold in the 1950’s. We wanted to take a moment to admire all of the beautiful designs we have from Sophie at Loop at the moment. 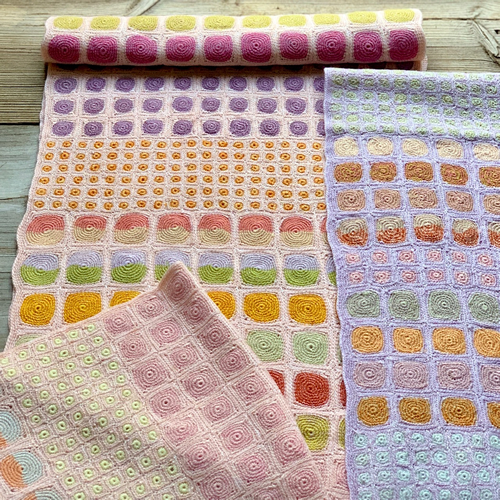 The new ‘Pschitt’ colour palette is light and playful, with lots of wonderful pastel tones of pink, blue, green and yellow. The above design, ‘Tangerine Dream’, has fun pops of citrus-y orange and lime, with some little hits of pop pink too. All of the Sophie Digard designs use over 60 different threads, all in different colours which they dye themselves in Madagascar, to make up their rich, intense tones. We love the handmade nature of these shawls, with no two being the exact same. These are truly items to treasure. 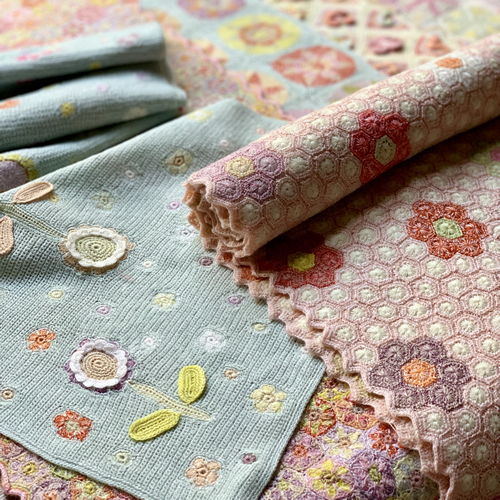 For Spring 2019, we have two brand-new-to-Loop designs from Sophie Digard. We now have the ‘Dreydel‘ shawl, with complex wheel designs, and the ‘Forainterieurs‘ shawl, which has a wonderful large flower-like design. The stitches on these shawls are just so tiny, we can’t believe how beautiful each one is! We also stock some of Sophie’s exquisite handmade toys at Loop! We have two designs of doll, the Alice and the Charlotte. Each doll is completely unique, with beautiful hand embroidered faces, and incredibly detailed hair. Loop also stocks these exquisite lion toys by Sophie. We can’t get over how gorgeous these gentlemen are, we think they look like characters from children’s stories; Sophie Digard designs items which defy the dictates of time. We just have a few of these very precious lions. They have velvet faces, with embroidered manes and faces. One is made with linen thread, and one with merino. Again, each lion is unique in his own way with their long buttoned coats and scarves. Wow! We hope you enjoy all these beautiful items as much as we do! Stay tuned to our blog next week where we are giving away an incredible to gift to one lucky person, from the women at Mrs. Moon yarns and us! Follow us over on Instagram at @LoopLondonLoves where we post things throughout the week and where our prize draw will take place next week. More information to come soon. Happy Knitting and stay warm! ‹ CaMaRose Lama-tweed – instant cosiness! I love her work, true artistry.